It's interesting the power we, as individuals, now have. We can change the outcome of a country election within hours. Today, five years ago, this happened. On 14th March 2004, Spain had their general election. In the weeks running up to the election, the PP (Partido Popular) has been the favourite. It wouldn't be a landslide but they were looking good. Then, just three days before the election - the unthinkable happened. On 11 March, Spain experienced an unprecedented terrorist attack. The 2004 Madrid train bombing killed 191 innocent people, and injured thousands others. I'm sure we all remember it. My brother was living in Madrid at the time, not far from the explosions. Jose Maria Aznar, the PP party leader and Prime Minister, immediately accused ETA, the basque separatist and terrorist organisation, of the attack. And he continued to accuse ETA despite the growing evidence that the attack was not ETA, but Al Qaeda inspired. Many felt that the PP wanted to hide any association between the attack and Al Qaeda - as an Al Qaeda attack would confirm the poor decision of the PP to send troops to Iraq. There was much talk that the PP were holding back evidence linking the train attacks to Al Qaeda. This kicked off a very emotive call to action for the Spanish population. They would show the PP. And they did. 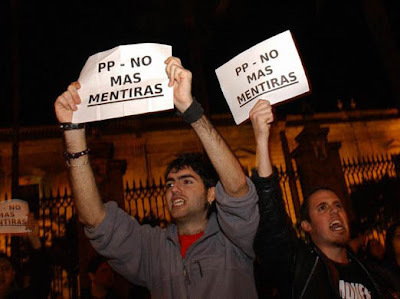 On March 13th - the night before election day, now known as the 'night of small text messages' - thousands gathered in anti-PP rallies in Madrid and 14 other cities throughout the country. All mobilised through text messages and partly though the internet. On 14th March 2004 - Spain saw a 40% increase in text messaging. It also saw a very high turnout of voters - 75%, many of whom were young and had not voted before. The result. The Socialist Party, led by Zapatero won. Or, more accurately - the PP lost. We are more and more closer to reaching a completely globalized age, wherein geographical boundaries and mainstream communications, which many times focus on local events are no longer barriers in youths quest for knowledge and information. More and more are young people realizing their power and rights and exercising said rights for the better. Now it is up to us to, the youth, the future, to exercise that power correctly; to choose correctly and not let greater influences- or those who wish to use our power, for their purposes- blind or corrupt us. We have to be informed and we have to be critical. Great changes are taking place in the world and it will be up to us to protect that which we love.